Sunday's PAS fieldtrip to the Bayano was an utter success by all counts. The crowd amounted to thirty participants, yet we didn't have any casualties. And if that weren't miracle enough, we saw many a good bird, and lifers for everyone. A first stop at the Bayano bridge produced the first of maaaany Cocoi Herons, a Bare-throated Tiger-Heron, Pied Water-Tyrant and great looks at a pair of Jet Antbirds. But the fun really started at the Río Mono bridge. 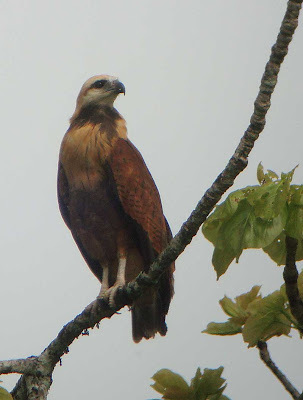 Not five minutes after our horde arrived, Rosabel Miró spotted a raptor with a bright rufous back perched looking the other way in a distant tree. The head was buffy, whiter on the crown, and if you squinted you could even imagine some black in the chest. 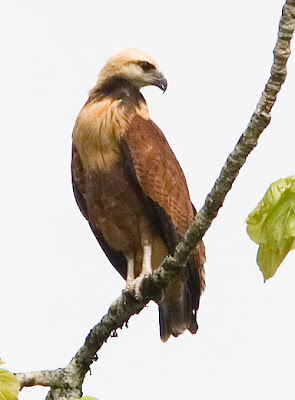 The back had sparse black streaking, and there was a slight dark eyeline, reminiscent of Yellow-headed Caracara. 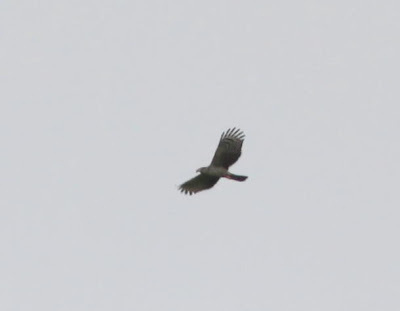 Even though the bird flew away before everybody saw it, we had no doubt we had a Black-collared Hawk (especially after seeing the better plate in Garrigues). Luckily, it didn't go far, and it was re-spotted perched in a cuipo tree a little bit up the road, where it posed for ten or fifteen minutes. Photo on top, Björn Anderson; below, Rosabel Miró, Karl Kaufmann. 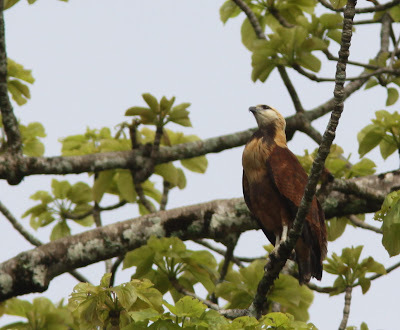 Later on, a male Hook-billed Kite soared above us for a minute or two (photo, Björn Anderson), while a Barred Puffbird whistled unseen paying no attention to the looming rain clouds. White-eared Conebills made brief, distant appearances, but the group walked on to a nearby trail for some interior forest birding. 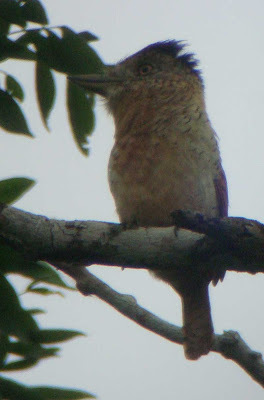 The trail was quiet and muddy, but we found a single male Black Antshrike (photo, Björn Anderson) among the dozen or so Western Slaty-Antshrikes of both genders. A while later the rain finally convinced us to head back to the cars. Most of the group called it a day, but the insane ones made one last stop at the Río Mono bridge, for even better looks at Conebill (two males and three or so females out on some open trees just above eye level). 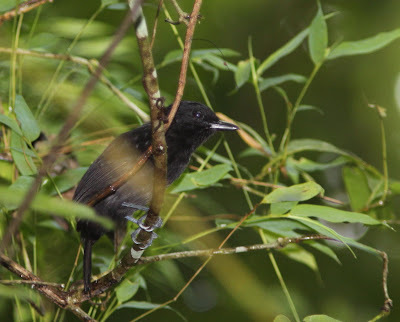 Just as we were about to call it a day for good, Jacobo Ortega arrived and magically produced the Barred Puffbird that had been whistling at us all morning (photo, Rosabel Miró). Exhausted and finally satisfied, we headed home. Jacobo soldiered on, and later saw a pair of Orange-crowned Orioles.